The use of herbs, vitamins for hair growth in dogs is a subject of growing interest as we learn more about healthy nutrition for our pets. Healthy hair can be any canine's crowning glory, with the possible exception of the Chinese Crested Hairless, but even this breed should have a lovely mane, tail and anklets. Whether you're trying to grow a superior coat on a long-coated show specimen, or you're trying to help your dog re-grow hair lost due to skin problems, it's good to know a thing or two about nutrition and how it affects your dog's ability to grow hair. 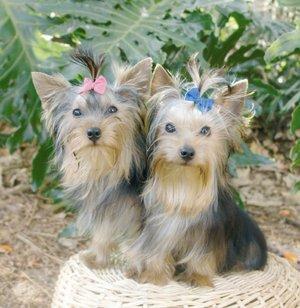 There are many herbs, vitamins for hair growth in dogs. They either nourish the hair directly or support other functions that ultimately help hair grow. Let's take a closer look, but keep in mind that you should never give your dog any supplement without first consulting with your vet about safety and proper dosage. Evening primrose oil contains gammalinolenic acid, a fatty acid that promotes the health growth of hair, skin and nails. Flax seed oil is a very good source of Omega-3 fatty acids, which are believed to be beneficial in many ways, including promoting healthy skin and hair. Grape seed extract is another natural antioxidant that neutralizes free radicals that can damage your dog's hair. The root of each hair depends on nutrients delivered through the bloodstream. Horsetail is believed to have a beneficial effect on the circulatory system, especially in the scalp. It's also rich in silica, so it strengthens hair, helping your dog to maintain a healthy coat. Kelp is rich in iodine, and iodine is beneficial in cases of hypothyroidism that lead to hair loss. Lecithin is a good source of fatty acids, choline and inositol. These substances work together to reduce stress as well as aid hair growth. Nettle promotes circulation and is naturally full of vitamins and minerals. It's useful in combating allergies and other skin disorders that can lead to hair loss. Red clover is beneficial in treating skin conditions such as eczema that can retard hair growth. Rose hips are believed to reduce stress, which can play a factor in your dog's hair growth. This herb is also very rich in vitamin C, another antioxidant. Rosemary is a natural antioxidant that fights against free radicals that can damage dog hair. This herb is also believed to unclog hair follicles and encourage hair re-growth. Saw palmetto is used to combat the hormone DHT which can interfere with hair growth. It's also believed to slow down the shedding process. There are many benefits provided by Siberian ginseng because it aids circulation. It's also believed to remove toxins and stimulate hair shafts for accelerated growth. Yucca is a good general detoxifier, and is also beneficial in relieving stress and treating skin disorders that can interfere with healthy hair growth. Vitamin A lubricates the root of each hair to promote hair growth. Vitamin E increases oxygen in the blood supply, and promotes circulation for healthier skin beneath the hair. B vitamins are needed to support a number of bodily functions, including those that govern hair growth. Vitamin B complex provides a balanced portion of several B vitamins that work together. Although each B vitamin has a specific function, B complex vitamins are more efficient when they are grouped together. Omega-3 fatty acids support cell growth, and can benefit your dog's skin as well as his hair. These essential amino acids are found at their highest concentrations in fish. You can also provide Omega-3 supplementation by adding fresh fish oil to your dog's diet. Zinc is a trace mineral that helps the body utilize protein. Although we've covered specific herbs, vitamins for hair growth in dogs, it's never a good idea to give large doses of any single supplement. Vitamins and minerals work together, and it's possible to overdose your dog and make him sick. Additionally, some herbs do not interact well with each other. Ideally, your dog's food should provide him with the kind of balanced nutrition that supports overall health, including healthy hair and skin. However, if the recent dog food recall has revealed anything, it's that we can't always count on a processed mix as a safe food source. That's why more and more owners are beginning to feed their dogs fresh, human grade foods. If you feel the need to supplement your dog's hair growth, it's best to do it by giving him a balanced multi-vitamin formulated especially for dogs. Homeopathic veterinarians can also advice on how to provide supplementation using herbs and/or vitamins. There are a number of canine multi-vitamins and herbal remedies on the market that claim to promote healthy skin and coat. It's wise to have your vet examine the ingredients list of any supplement before you give it to your dog.